There are main tourist destination in Russia. The destinations usually around the journey of Golden Ring, traveling on big rivers like the Volga. In addition, long distance trips like the Trans-Siberian railway line. Starting from 2013, many people was visit Russia. Its arround 28.4 million tourists. The total makes Russia the 9th most visited country in the world and seventh in Europe. The most popular tourist destinations in Russia are Moscow and Saint Petersburg. Kremlin is a historic fortress in the center of Moscow. Brick was the main material for the construction of the Kremlin in the 15th century. Kremlin is bordered by the Moscow River to the south. There are St. Basil Cathedral and Red Square in the east. There is Alexander Park in the west. The length of the Kremlin’s wall is more than 2 km. While its height reaches 19 m, its width is 3.5-6.5 m, and its width is 27.5 ha. Kremlin has 20 towers, the most famous is Spasskaya. Spasskaya Tower reaches 67.3 m with 6 m diameter center clock. Kremlin fortress is not just plain standing, it has relics such as churches with Russian cemetery cemeteries. There is also an army hall where there are various heritage items. Its including horse-drawn carriages, crowns, clothing, jewelry and weapons that are still tsar ownership. That unique building was the residence of the Czar of Russia. Now Kremlin become the president’s office. There is a church in the front square arround Kremlin. Now that place become a place of inauguration of the president. Around the field, there is a canon made of bronze in 16th century. A large area makes Kremlin the largest official resident in the world. Its along with the White House and Buckingham Palace. See also best places in Moscow for muslim traveler. Red square became a place of ceremonies. It became the starting point for the Military Parade on every Russian Victory Day. There is the Soviet Union History Museum, St. Basil’s Cathedral around Red Square. The construction of the museum occurred in the 14th century along with the fall of Kazan era. There is Lenin Mausoleum whereas place for Vladimir Lenin preserved body. This museum stores various objects that related to art and culture. The goods not only from Russia, but all over the world. Hermitage is the largest and oldest museum in the world. There are about 3 million collections stored neatly in 6 buildings. But you can not see all the objects stored in the Hermitage Museum. You can visit 5 of the 6 existing buildings. There are Winter Palace, Small Hermitage, Old Hermitage, New Hermitage and Hermitage Theater. Lazarus’ Resurrection Church is the oldest wooden church in Russia. Its construction was done at the end of the 14th century. It has 22 domes with unique shapes. Uniquely, this building does not use nails in its construction. Instead, pieces of wood have been united to form even the most complex structures. The beauty of this church on the lonely island is so captivating the eyes of tourists. Usually, they come to explore the wilderness of Russia. Moscow Metro is a fast train system. Its serving the Moscow region as well as several neighboring cities. Such as Krasnogorsk and Reutov. Mayakovskaya is the most beautiful subway station in the entire Moscow Metro system. The station is arguably different from the others. The ceiling has 34 ceramic mosaic motifs. 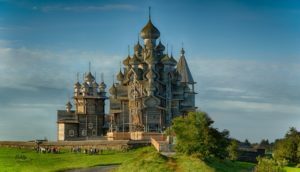 Thats all some unique facts of russian architecture. They always make tourist interest with their beautifulness. Are you ready to go to Russia?